The first, moss-like plants emerged on land about 470 million years ago. In just 25 million years, they stripped the planet of vital minerals, wrecked Earth's carbon cycle, started an ice age, and caused a mass extinction of marine life. That's the finding of researchers at Oxford and the University of Exeter, who set out to figure just what role the first terrestrial plants had on Earth when they emerged in the Ordovician Period. Previous research into this time revealed that the climate went through a massive cooling phase that triggered a series of ice ages. 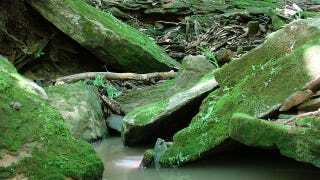 We know that this was started by a sudden drop in the amount of carbon, and now the researchers say they've identified the source: the moss-like plants that first colonized the land. Once these plants set up shop on the land, they basically started strip-mining, extracting minerals like calcium, magnesium, phosphorus, and iron in order to keep growing. This changed the composition of the rocks around them, which is known as chemical weathering. As the plants extracted these minerals, the rocks absorbed carbon dioxide, which removed enough carbon from the atmosphere to make global temperatures drop nearly ten degrees Fahrenheit. It gets worse. Releasing phosphorus and iron from the rocks sent these minerals into the oceans, where marine organisms used them to bury even more carbon, which caused another five degree drop in temperatures. The researchers suggest this process also could help explain the Ordovician-Silurian mass extinction that wiped out a massive percentage of marine life. That's at least as likely as some of the competing explanations for this particular extinction event, which include a massive gamma-ray burst. The researchers reached these conclusions after three months of work with the moss Physcomitrella patens, a modern species that served as an analogue for the first land plants. They tested how the moss affected the chemical weathering of various rocks, then used an Earth system model to figure out how this weathering could have reshaped the Ordovician. The results, as you can see, are quite dramatic. In a statement, the researchers argue that this speaks to the massive effect that plants have on our planet, emphasizing their power to regulate carbon levels and, by extension, the climate as a whole. That's all well and good, but I can't help but feel that we've been outdone at what we do best by a bunch of plants. Ruining the planet is our job, you mossy bastards! Via Nature Geoscience. Image by Shes Not There on Flickr.